Police used water cannons to prevent any mishap and disperse the farmers who attempted self-immolation. Police baton-charge farmers of Azad Kisan Union after they attempt self-immolation. Photo Credits: ANI. Lucknow: Police baton charged sugarcane farmers led by Azad Kisan Union who protested outside the Collector office in Uttar Pradesh’s Bijnor on Monday alleging non-payment of dues, according to news agency ANI. The farmers threatened mass suicide by attempting self-immolation. Thus the police deployed the service of water cannons to prevent any mishap and disperse the crowd. At least 8 farmers including Rajendra Singh, the national convener of Azad Kisan Union were detained by the police following the incident. 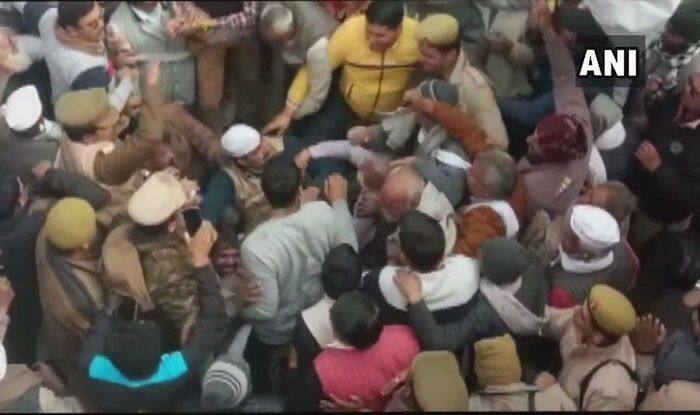 The violence resorted to by the police was condemned by BJP MP Bhartendra Singh. The farmers protested as dues amounting to Rs 824 crore were not met by nine sugarcane mills of the district until January 31. Out of the total dues, Rs 62 crore is the amount outstanding from the previous year. The sugar production in Uttar Pradesh was 53.36 lakh tonnes till January 2019 of 2018-19 marketing year compared to 53.98 lakh tonnes in the corresponding period of the previous year. Meanwhile, West Bengal Chief Minister Mamata Banerjee on Monday alleged that the Modi government had “snatched” farmers’ sleep and claimed they were being cheated before the general elections. “The BJP, the Modi government have snatched farmers’ sleep,” Banerjee said, claiming that nearly 12,000 farmers have committed suicide in the country.